INFINITY INC #1 (2007) - Lex Luthor - 52 - NM Comic! 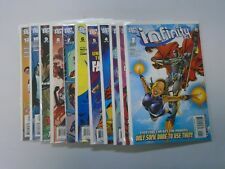 Infinity, Inc (DC 2007) COMPLETE SET LOT RUN (1-12)! Peter Milligan ALL NM Nice! INFINITY INC (2007) #'s 1-9 "LUTHOR'S MONSTERS" & NEAR COMPLETE "THE BOGEYMAN"
This page was last updated: 22-Apr 05:29. Number of bids and bid amounts may be slightly out of date. See each listing for international shipping options and costs.